Welcome back to Virgin River! 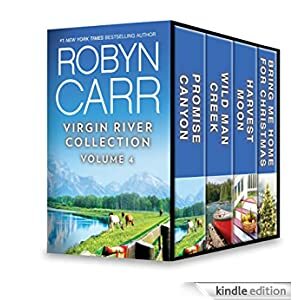 Now available in a box set collection, return to this charming small town with more beloved stories form #1 New York Times bestselling author Robyn Carr, selling today for only $2.99. Promise Canyon: After years spent on ranches around Los Angeles, Clay Tahoma is delighted to be Virgin River’s new veterinary assistant. Harvest Moon: Disillusioned and burned out after collapsing at work, rising sous-chef Kelly Matlock has retreated to her sister’s house to rest and reevaluate. Bring Me Home for Christmas: This year, Becca Timm knows the number one item on her wish list—getting over Denny Cutler, who broke her heart three years ago.